Right now, if I create a CV on Careers (or via the "edit CV" link on my Stack Overflow profile), I can reserve a "slug" that'll let me link to my CV via a custom URL of the form https://stackoverflow.com/cv/slug. Once I've entered a slug, it'll be reserved within the system - no one else can use the same slug, even if my CV isn't currently public! So for example, I can't take the slug "jon", because someone named Jon already has it. And I can't take the slug "mike", because someone else already took that one too - even though their CV isn't currently visible. Here's the important part: It's no longer possible to "squat" a URL in this way with the Developer Story. 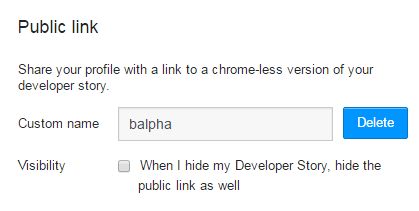 Either you pick your URL, then stackoverflow.com/story/zaphod is accessible, or you don't, and then it isn't. This makes sense for a new system; there are probably a whole lot of fairly attractive slugs out there that were picked on a whim and then forgotten about; they've never been used and they'll never be used by anyone. /cv/xyz and /story/xyz always come together, you can't have one without the other. Right now, "mike" has a reserved slug; he may have never used it, or he may have used it yesterday and made it private this morning; it doesn't matter, because until now that slug was safe - he could change the visibility of it as the situation warranted. Job-searching? Make it public! Want to protect yourself from idle doxing? Make it private! Here's the thing: I have no idea how many people actually did this. I just know it was possible: the system made it easy, and there was no penalty associated with it. One could, for example, keep your CV and slug private for two years, briefly make the slug point to something valid for the duration of a job search and then hide it again for another 5... Knowing that it'd still be there when you were ready for it. It's not an essential feature, but it's one the system offered and one I'd have to assume was used to some extent. Well, we're about to pour salt on a whole bunch of slugs, and I think we should probably try to find out how many are potentially lurking out there somewhere, on business cards or printed flyers. For some slugs, it probably doesn't matter if they're technically up for grabs for a while. But for things like people's first names or other short words, we have to assume that - if not currently reserved - they'll be snatched up in short order. Once the beta ends and folks are actually using this new system, that could be catastrophic: if everyone who temporarily disabled their slug in the old system fails to make it public in the new system immediately, we can pretty much guarantee some of them won't be available a few days/weeks/months later when they get around to it. Now, I'm not terribly familiar with the historical data available for Careers profiles. It may be that we can't know if a given slug has ever been public... In that case, I suggest we must reserve all current Careers slugs, in perpetuity, lest their owners find a slug they've used in the past now pointing to someone else's CV. This applies to many things: usernames, domain names, email addresses, etc. Tim Berners Lee wrote about "Cool URIs don't change" back in 1998. He was talking about URIs going dead − but this is even worse: these are URIs that stay the same, but change meaning! These links don't just rot, these are links that you put in the fridge and forget about and when you encounter that piece of meat two weeks later it's turned into an orange but you don't really have a way of knowing and you just cooked the world's first chilli con carne with an orange. Because with the new system someone landing on a slug has no way of knowing if the content being shown is what was actually intended. I've been offering URLs to my CV for years simply because I want people to be able to get an updated version easily. It used to be on my own website (and this is a "cool URI" as it still works). I typically try to avoid "someone else's" URIs for things like this so that I'm not the victim of poor decisions of a third party (e.g. after Google code shut down my URIs continues to work as I used my own domain). For some reason I figured that Stack Overflow could be trusted to do the sane thing here. A mistake on my part, it seems. Note that this also opens up people to abuse. My slug being taken by accident is fairly unlikely as I happen to have a fairly unique last name, but what if I make it private after I've landed a job and someone replaces it with "HAHAHAHA I EAT OFF MEAT FROM UNDER THE FRIDGE"? Not exactly unthinkable. And what about nefarious recruiting agencies? Are you sure they can't think of ways to abuse this? They could potentially "squat" slugs that were active in the past but are no longer, just like every expired domain name gets taken over by some advertising company. In short, cool URIs don't change. Not in location. Not in meaning. The current jobs system is by far the most sane system. We're bringing back the possibility to reserve (i.e. choose but hide) the vanity slug. We're doing this for everyone, so we're going beyond just grandfathering-in people who have used the option previously, as suggested here. When importing a CV into a Developer Story, where the CV has a vanity slug, the Dev Story will have the same slug. If the CV was private, then the Dev Story preferences will be set to have the same effect. Not the answer you're looking for? Browse other questions tagged feature-request status-planned jobs developer-story cv-import .